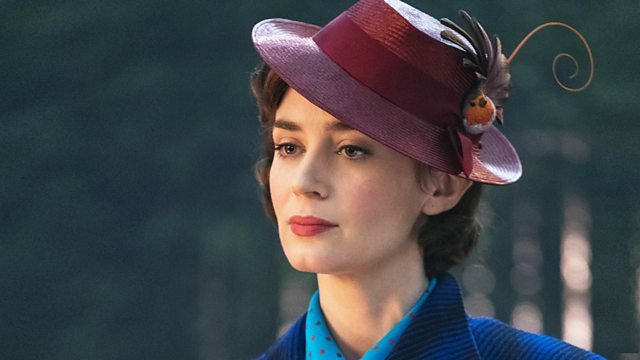 Mary Poppins returns to the silver screen with Emily Blunt in the title role and Lin-Manuel Miranda as Jack the lamplighter. It's a sequel not a remake with all new songs very much in the style of The Sherman Brothers' originals. Is it unfair to compare it with the much-loved Disney original? or is it impossible not to? The screenwriter of Black Panther, Danai Gurira's play The Convert at London's Young Vic stars Letitia Wright and Paapa Essiedu. Set in late 19th century Africa, a young woman is working for a devout Catholic priest who wants to spiritually mould her. BBC1 has some BIG Christmas drama offerings. And it includes a 3 part adaptation of Andrea Levy's award-winning novel The Long Song, set in Jamaica during the final years of slavery and the transition to freedom. Tom Sutcliffe is joined by Andrew O'Hagan, Rowan Pelling and Stephanie Merritt. The producer is Oliver Jones. Main image: Emily Blunt as Mary Poppins in Mary Poppins Returns. Credit: Disney Pictures. Andrew recommends The Life of Saul Bellow, Vol II - Love and Strife, 1965-2005 by Zachary Leader. Rowan recommends Matthew Bourne's Swan Lake. Stephanie recommends The Affair, ITV. Tom recommends James Joyce's Letters to Nora. Mary Poppins Returns is in cinemas nationwide from 21 December 2018. Photo: Emily Blunt as Mary Poppins in Mary Poppins Returns. Credit: Disney Pictures. The Convert is on at The Young Vic in London until 26 January 2019. The Wall by John Lanchester is published on 17 January 2019, by Faber and Faber. Photo: John Lanchester. Credit: Faber and Faber. The full series of The Long Song is available on the BBC iPlayer until 19 January 2019.